All conveyances of land in Connecticut must be in writing, subscribed by the grantor with or without a seal, or by his/her attorney authorized for that purpose, acknowledged and witnessed in the manner provided by law for conveyances (sec 47-5). The forms set forth in 47-36c of the Connecticut Statutes can be used for a conveyance of real property in this state. However, the inclusion of these forms in the statutes does not prohibit the use of other deed forms. In a warranty deed, the use of the words "with warranty covenants" has the force, meaning, and effect of the following covenants: (1) that at the time the deed was delivered, the grantor was seized in fee simple of the granted premises; (2) that the granted premises are free from all encumbrances, except as may be set forth in the deed; (3) that the grantor has good right, full power, and lawful authority to sell and convey the same to the grantee; and (4) that the grantor, his heirs, executors, and administrators will warrant and defend the granted premises to the grantee and his assigns forever against the claims and demands of all persons, except as may be set forth in the warranty deed (47-36d). 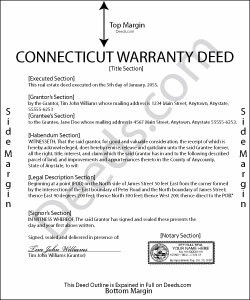 If a warranty deed is acknowledged in Connecticut, the acknowledgements may be made before a judge of a court of record, a clerk or commissioner of the Superior Court, a justice of the peace, a notary public, or a town clerk (47-5a). If the warranty deed is acknowledged out of state, it may be made before any of the officers listed in section 47-5a. A warranty deed executed out of state will be valid in Connecticut so long as it has been executed and acknowledged according to the laws of that state (47-7). The warranty deed must be signed by the grantor. Land records are recorded in the office of a city or town clerk in Connecticut. This state does not authorize county recording. No warranty deed will be effective to hold any land against any other person but the grantor and his heirs unless it is recorded with the town or city clerk in the town or city where the land is located. The first recorded deed will have priority over later recordings for the same real estate. Upon delivery to the grantee, a conveyance is effective as against the world, provided that it is recorded within a reasonable time period following the delivery. If the warranty deed is executed by a power of attorney, the power of attorney should be recorded with the deed, unless it has already been recorded in the town where the land is located and the power of attorney is referenced in the deed (47-10).